The Japanese surrendered on 14 August 1945 which ended the second world war and the official document was signed on 2 September. The next meeting of the Barford Parish Council was just days later. One subject the Council discussed was whether there should be a Memorial for those from the village who lost their lives in the war, and if so, what form it should take. The members agreed that this was a decision which should be made by the whole village, So a Parish Meeting was called for 17th September. Mr Walter Howard chaired this well attended Parish Meeting. It was generally agreed that there should be some form of Memorial and he asked the villagers for suggestions. Mr Leslie Carter, a local farmer, is said to have proposed a shelter for bus passengers to the local town, Warwick. Other recorded suggestions were a bus shelter on each side of the road and a Lych Gate.. When it was proposed that a Barford War Memorial Committee should be formed. Colonel E L Watson, of Hareway Lane, volunteered; he was later elected as Chairman. Other volunteers were Mr Leslie Carter who also served on the Parish and Rural District Council, Mr Walter S Howard, who was Chair of the Parish Council and lived on Church Street, Mr Richard Hemmings from Mill House on Red Lion Lane (now called Mill Lane), Mrs Mary Barker from Watchbury House, Mr John Hadley a butcher on Church Street, Mr George Worrall, the village blacksmith who had recently returned from the war, Mr William Bacon, a plumber and decorator from Bridge Street, Miss Olive Shirt, Major Oswald Tritton, and Mrs Alison Howard. Mrs Leslie Carter took on the role of secretary. Several of these also served on the Parish Council. The Committee’s role was to decide what form the Memorial should take. They were also tasked with its design, choosing a suitable location, obtaining the various permissions, its installation and of course raising the required funding. They were asked to report progress to further Parish Meetings from time to time. However there was still some way to go! At the Parish Council meeting on 30 July 1947 the Committee announced that some land alongside Wellesbourne Road on which the Bus Shelter will be erected had been conveyed to the Parish Council. This land was previously owned by and donated by Mr Alastair Graham. The Committee also asked for the Parish Council to apply for a temporary bus shelter until the Memorial one was completed but was told that this was the responsibility of the Memorial Committee. At their meeting in March 1948 the Parish Council were informed that a house is to be built for the village policeman, quite close to where the Memorial Shelter will be sited. The Councilors recorded their objections to this and suggested that it would be more appropriate if the police house was sited in the Council Housing Estate, presumably along Wasperton Lane!! This was apparently rejected as the police house was built near the Shelter on Wellesbourne Road. However by the 1990s Barford, like other villages, had no resident village policeman so the house was no longer needed. It was sold into private ownership. After a very early start, it had taken just over 4 years to get to the stage when the Bus Shelter Memorial on Wellesbourne Road was ready. It was a brick and tiled bus shelter with seating and an internal light. A ‘pull in’ was built in front so that buses did not block the road while they were stopped. 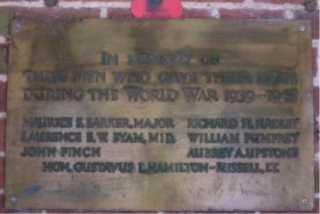 The plaque had the names of seven Barford men who lost their lives on active service during the war. From various reports we know that the architectural design work was done by Mr Arthur C Bunch, a former Warwickshire County Architect living in Binswood Avenue, Leamington. It was built by William Stowe who had been a resident of Barford but who by then lived in Stratford. There was no further mention of the Memorial Bus Shelter in the Parish Council minutes before the dedication and official opening of the Memorial. Sadly the minutes of the Memorial Committee itself have not been found; I am sure they would have revealed some interesting stories. There was a big turnout of villagers on the afternoon of Sunday 25th September 1949. As well as those involved in creating the Memorial there were undoubtedly relatives and friends of the fallen and there were members of the Barford Branch of the British Legion Club which at that time had a club room in Cedar House on Bridge Street. One would like to believe that it was a beautiful sunny early autumn day. At the start of the ceremony, the deeds were handed over to Alderman Walter Howard, the Parish Council Chairman by Colonel Watson, Chairman of the Memorial Committee. In doing so he expressed the Committee’s concern that proper respect should always be shown for the significance of this village War Memorial. He particularly requested that parents should make sure their children understood the reason why it is there. Alderman Howard on accepting the deeds, said the Parish Council would now accept responsibility for the upkeep of the building. The Memorial Tablet was unveiled by Colonel Gordon Barker who had been brought up in Watchbury House on High Street. He had served in the Royal Dragoons during the war. He spoke of the significance of the occasion, and read out the names of the seven men from the village which are on the Tablet inside the shelter. Col. Barker said he felt a great sense of pride and gratitude towards those husbands, sons and brothers of the village whose sacrifice in the war they were commemorating that day. He was proud to have lived the life of a soldier until a few weeks ago because it had enabled him ‘to share the lives of these men and to realise their high sense of duty. In the war, little indeed stood between subjugation of our country and liberty. Only the courage of such men as these had saved us’. The Archdeacon of Warwick, the Venerable Malcolm Parr, then dedicated the Memorial and led the prayers. Life With the Bus Shelter Memorial in Barford. There was little further mention of the Memorial in the Parish Council minutes in the 1950s – apart from occasional comments, initially by Miss Shirt, on the untidy state of the interior. Contact was made with the local Council to request that the duties of the Road Sweeper should include its cleaning. This was a service that, seems to have been agreed at the time but eventually stopped because the job was mechanised so it is rarely cleaned nowadays. As the years have gone by the Memorial Bus Shelter is used by fewer people as many more villagers have their own cars. The buses are less frequent for several reasons. On the other hand, with the growth of Barford, additional bus stops have been set up in the village and, where possible, shelters have been added to those. Also it seems at one time, some people considered that the Memorial was not always respected by the young. Some older villagers today have even been heard to imply that they did their early courting in there. But why not? At some time, probably in the 1990s, the seat was removed by the Barford, Sherbourne and Wasperton Joint Parish Council (JPC), the replacement for Barford Parish Council. Also the electric lighting was disconnected, probably for cost reasons. In 2014 Taylor Wimpey put in a planning application to Warwick District Council (WDC) to build on the land behind what had been the police house. This land had until recently been where Mr Rod Deeley ran his Nursery Garden Centre with its excellent range of plants. Westham Lane was a suitable access for the Nursery but not for an estate of over 50 houses. The planning application consisted of many documents. It was noticed that access was to be through the land still occupied by the old police house which Taylor Wimpey planned to purchase and demolish; a touch ironic when you remember the Parish Council’s attitude to building he police house there in March 1948. Deeper in the detail and less noticeable was that Taylor Wimpey had employed an engineering firm to review at the road safety aspect of vehicles joining and leaving the Wellesbourne Road at that point. This report stated that buses stopped at the at the Memorial bus stop could block visibility for vehicle drivers entering and leaving the new estate. It proposed filling in the ‘pull in’ in front of the Memorial Bus Shelter and moving the bus stop to an undefined point along the road. No officers from WDC Planning or from WCC Highways high-lighted this potentially sensitive point and no-one from Barford JPC noticed it during the planning meetings before the application received approval in 2014. Thus the first time it was noticed was in 2016 when the ‘pull in’ was filled in and a temporary bus stop set up along Wellesbourne Road towards Westham Lane – with no shelter of course!! No consideration or respect seemed to have been shown to the Memorial and its reason for being there. It also implied that pedestrians and bus users no longer mattered compared with car users. The JPC and many villagers, some of whom were direct relatives of the men whose names were on the tablet inside the Shelter raised objections. However the first response from WCC was that it had been reviewed and agreed using the proper process and that it was a traffic safety requirement. In 2017, after a certain amount of pressure from several directions, WCC Highways Department took into account the fact that the stop was not heavily used and not many buses would actually block driver’s visibility. Other factors were that the Highway Code implies that car drivers at junctions are to wait until the road is clear, that there was no more suitable place for the bus stop and that the Memorial Shelter did actually mean something to the villagers for what it was. So WCC returned the bus stop to the Memorial Bus Shelter and by 2018 had even laid some hard standing across the grassed over ‘pull in’ so people could get on and off the buses without walking through mud and long grass. In 2018 the JPC replaced the seating that had been removed in the1990s. During these problems it was discovered that this Memorial had never been entered onto the Imperial War Museum National Register or on the Warwick District Council’s list of Village Assets. The first of these tasks has now been completed and it appears as Memorial number 76682. It can be seen on the website www.iwm.org.uk/memorials. Then search for 76682 and click on the photo of the Plaque. In the words of a well known local Poet and Playwright – ‘All’s Well That Ends Well’ – so perhaps we are nearly there. But there are still a few things outstanding to ensure that it is maintained and continuously recognized as stated at the dedication ceremony in 1949. – find the Deeds which were handed over to the JPC in 1949. – decide whether the JPC needs to clean the roof tiles . – install some form of light indicator so that after dark bus drivers can tell when passengers are waiting. A committee that was formed in Barford on 17th September 1945 which later decided that the War Memorial for those from their village who fell during the second World War (1939-1945) should be a much needed Bus Shelter for the everyday use of the village. Built of brick with a tiled roof with a seat for waiting passengers, originally with a pull-in for buses alongside the shelter. (This was removed by Warwickshire County Council Highways Department in 2018). A brass commemoration tablet, with the names of the fallen. is in the centre of the rear wall. At the dedication service on 25 September 1949 the Barford Parish Council Chairman was presented with the deeds of the land on which the Memorial stands. On receiving these he said the Parish Council would now accept responsibility for the upkeep of the building. A discussion was then held as to whether any Memorial should be made in commemoration of the War and what form it should take. A Parish Meeting will be held on Monday 17th September at 7.30. There was a good attendance for Barford, and after the Notice Convening the Meeting had been read Mr W S Howard was elected to be Chairman. Minutes of the last Parish meeting were read and confirmed. The Chairman then gave the reasons for convening the meeting and asked for any ideas of those present for suitable forms for a Memorial to take. The committee to be appointed should then consider these and any other ideas brought before them and then report back to a further Parish Meeting. Among the suggestions were a bus shelter, a lych gate, two bus shelters – one on each side of the road. The committee elected were Col E L Watson, Mr W S Howard, Mr R Hemmings, Mrs Barker, Mr J Hadley, Major Tritton, Mrs Howard, Mr G Worrall, Mr L Carter, Miss Shirt, Mr Bacon. The Chairman reported that the War Memorial Committee had requested the Parish Council to take over from the Committee, the War Memorial which will be in the form of a Bus Shelter. It was therefore resolved on the proposition by Major Tritton seconded by Mr L Carter and carried unanimously that the request of Barford War Memorial Committee for the Barford Parish Council to take over, maintain, repair and protect the Barford War Memorial which will be erected on land adjacent to the Wellesbourne Road and that the War Memorial Committee be informed that as from the date that the land and building as reported in the Barford Parish Council, that Authority will maintain the War Memorial in a proper manner subject to the clear limitation of expenditure approved by the County Council and the Ministry of Health. The Clerk reported that the land on which the War Memorial Committee will erect the Bus Shelter has now been conveyed to the Parish Council. Requests have been made to the Council for a temporary Shelter to be erected until such time as the permanent Building could be erected but the Council considered this a matter for the War Memorial Committee to deal with. The Clerk was therefore instructed to communicate with the Committee suggesting that application should be made to the Licensing Authorities for permission to commence the erection of the Shelter. Resolved that the Clerk should communicate with the County Architect regarding the siting of the new police house. The Council object to the position being fixed on Wellesbourne Road next to the proposed Bus Shelter site and consider if a house is necessary it should be within the District Council Housing Estate. 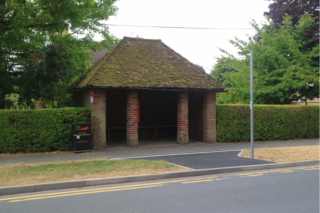 Complaints were received regarding the untidy condition of the Bus Shelter and it was resolved that the County Surveyor should be asked to allow the roadman to keep the Shelter tidy. Regarding the illumination of the shelter, Miss Shirt undertook to ask the District Council to move an existing lamp to a suitable position to illuminate the inside of the Shelter. When Barford’s new war memorial which takes the form of a ‘bus shelter was dedicated on Sunday, Col. E. L. Watson, Chairman of the memorial committee, appealed for the building to be treated with respect and to be regarded as something more than just a convenient place in which to wait for ‘buses. It was with the consent of the people of Barford who have subscribed the money for the memorial that the committee decided it should take the form of a bus shelter which was urgently needed in the village. Built of red brick, to an attractive design prepared by Mr A. C. Bunch, former County Architect, the memorial shelter stands on the main road through the village. On Sunday afternoon, in the presence of a large crowd of Barford people, including members of the local branch of the British Legion, Col. Watson handed over the deeds of the site, presented by Mr Alastair Graham – to Ald. W. S. Howard, chairman of the Parish Council. In doing so, Col. Watson said that some people had thought the shelter might be mis-used by children, treated as a playground and covered with pencil scrawling. He did not think that would be the case, but asked parents to make sure their children understood the significance of the building. He hoped, too, that visitors to Barford who might use the shelter would respect it as the village war memorial. Ald. Howard in accepting the deeds said the Parish Council would now accept responsibility for the upkeep of the building. A memorial tablet was unveiled by Col. Gordon Barker, a former resident, who spoke of the significance of the occasion, and read out the names of the seven men of the village which are on the plaque inside the shelter. Col. Barker said he felt a great sense of pride and gratitude towards those husbands, sons and brothers of the village whose sacrifice in the war they were commemorating that day. He was proud to have lived the life of a soldier until a few weeks ago, because it had enabled him to share the lives of these men and to realise their high sense of duty. In the war, little indeed stood between subjugation of our country and liberty. Only the courage of such men as these had saved us. The Archdeacon of Warwick, the Ven. Malcolm Parr, then dedicated the memorial and led the prayers. Members of the Memorial Committee were present and the secretary, Mrs Leslie Carter. The shelter was built by a Wellesbourne builder, Mr William Stowe, who formerly lived at Barford. It was Mr Leslie Carter, a member of the parish council and of Warwick R.D.C. who first suggested a bus shelter as a memorial. After many delays the Bus Shelter War Memorial was officially opened and dedicated on Sunday, 25 September. In the presence of a large crowd, Col Watson in a short speech, handed over the deeds to Mr Howard, who accepted them on behalf of the Parish Council. Col G Barker performed the opening and unveiled the memorial tablet. This was followed by the dedication and prayers by the Archdeacon. The blessing brought a short but very impressive ceremony to a close. We all sincerely hope that it may be kept in a manner worthy of the men who gave their lives and to whose memory it is erected. This page was added on 31/08/2018.